What exactly is a special guardianship order? - SGOs have been in the news lately, so I though a little explanation would be helpful. The best family justice? 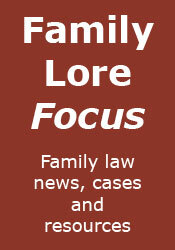 - It's what Family Justice Minister Simon Hughes says he wants, but are we getting it? A financial disaster - Looking at the disastrous facts of Mekarska v Ruiz & Another. Important cases: Hildebrand and Imerman - Looking at the 'self-help' cases Hildebrand v Hildebrand and Tchenguiz & Others v Imerman.